Royal Elizabeth will take its place at the culmination of Elizabeth Street and Royal Parade on the northern edge of the Melbourne CBD. Designed by Elenberg Fraser in-conjunction with Disegno Australia the 19-storey building calls on the groves of local eucalyptus to present a thoroughly modern and liveable interpretation of the classic Australian gum tree. Entering in through the luxurious ground floor lobby is the heart and hearth of the tree’s trunk. Tessellated tile walls form a rough bark skin and paved travertine flooring suggest the concentric circles of a tree’s growth rings, with a charred timber concierge desk as a dramatic centrepiece. Climbing up to the apartments inside, intricate detailing and abundant storage are key characteristics. Relaxed interiors house monolithic granite benches with silvery oak panelling, luxe woollen carpet, custom vanities, and jewel-like vitrines. Each apartment opens out onto a generous balcony to capture panoramic views of the city skyline, the undulating suburbs of western Melbourne, over the university campuses and gardens or up the beautiful tree lined Royal Parade to Royal Park. 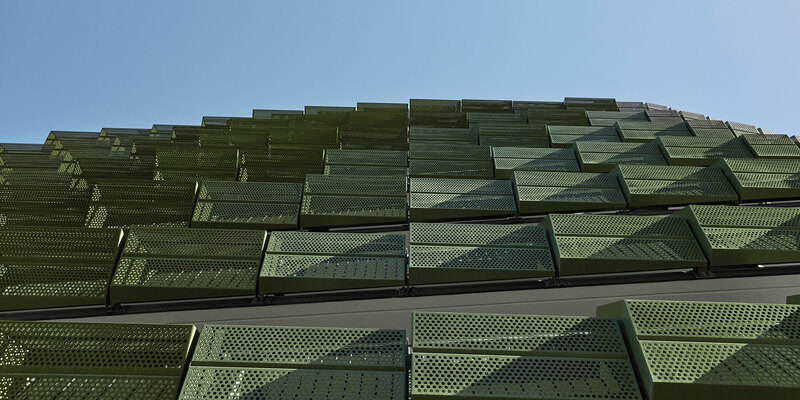 Ribbon balustrading wraps the building in hues of green with an organic perforated pattern welcoming dappled light inside. The tree’s canopy on level 19 is a warm, communal sun-drenched space with a fully equipped gymnasium and yoga room, a luxurious lounge with feature fireplace, a private dining room with catering kitchen and an architectural barbeque terrace with timber clad scalloped seating areas wrapping the perimeter.